That old law about "an eye for an eye" leaves everybody blind. The time is always right to do the right thing. (He was quoting Mahatma Gandhi who said, "An eye for eye only ends up making the whole world blind." Among my favorite long pieces: Declaration of Independence from the War in Vietnam and Letters From Birmingham City Jail. Injustice anywhere is a threat to justice everywhere. We are caught in an inescapable network of mutuality, tied in a single garment of destiny. Whatever affects one directly, affects all indirectly." Thousands are marching in Denver and across the nation in honor of Martin Luther King, Jr. today. Whether marching for peace, for justice or for human rights, there's a unifying feeling and spirit of hope that change has come and will continue. "Injustice anywhere is a threat to justice everywhere. We are caught in an inescapable network of mutuality, tied in a single garment of destiny. Let's make this an open thread for your hopes of change in the coming Administration. Here's a short video of Bill Clinton and Mike Huckabee sharing a pew and singing today at the Ebenezer Baptist Church in Atlanta. ” We worked together for several years on something that concerns everybody in this church: trying to turn the tide on childhood obesity, and childhood diabetes,”Clinton said.”A good man.”But he also said that they didn’t agree much on anything. In Memory and Honor of Dr. Martin Luther King, Jr.
A one-minute video that features excerpts from Dr. King's 1967 speech, Beyond Vietnam: A Time to Break Silence , April 4, 1967, Riverside Church, New York City, amidst images of King, Vietnam, Bush, Iraq and more. I've Been to the Mountaintop: April 3, 1968. Dr. King's last speech, the day before his assassination, in support of the striking Memphis sanitation workers. Dr. King's Letter from the Birmingham Jail . Today, Public Defender Stuff, written by investigators at Public Defender's Offices, hosts an excellent and eloquent tribute they call Welcome to the Martin Luther King, Jr. Day Blawg Review. I hope everyone will re-aquaint themselves today with the extraordinary words of wisdom, vision and passion of Martin Luther King, Jr. It takes only a minute to watch this video. 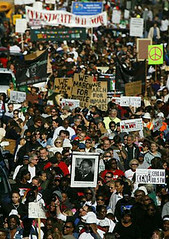 It features excerpts from Dr. King's 1967 Vietnam War speech, and ends with an appeal to take part in a Global Day of Protest on the one-year anniversary of the Iraq War. Alternet has an excellent compilation of some of Dr. King's most memorable quotes. Here are the links to the full text of just a few of his speeches.